is 5 euros. About SGD 10.50 or RM 24. And we're talking about 3 sticks, plus or minus cucumbers, sauce and choice of ketupat or nasi / mee goreng. Three Saturdays ago, we went to an Indonesian festival. 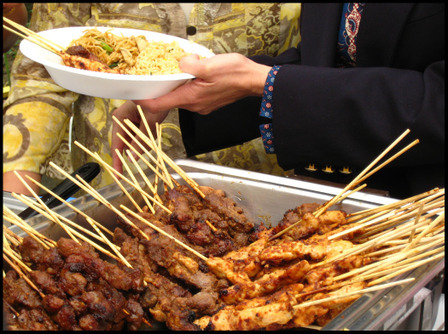 The flyers promised exotic dances and handcrafted items but our main goal was to gorge on authentic Indonesian food cooked by the Indonesian community. 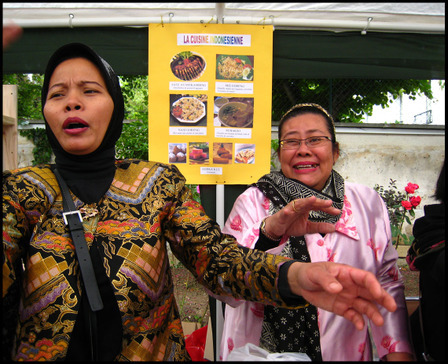 The crowds jammed the satay stall and the ever-cheerful ladies could hardly keep up. But even more enak were their dishes such as beef rendang, grilled fish in rojak spice and chicken pepes, all highly nuanced with aromatic herbs which may have been specially flown in. They certainly tasted nothing like the lame stuff we've been fobbed off at in Singapore so many times over, what we ate here literally jumped with new and exciting flavours, just a glimpse of what real Indonesian food tastes like. Too bad they only hold these events once a year! The following Saturday I received news of a charity bazaar organised by the diplomatic spouses of the Malaysian embassy. Other than satay, there was nasi lemak with beef rendang, kuih-muihs, roti murtabak and even a teh-tarik man. The food was generally not as good as the Indonesian contingents' but we were certainly not complaining since to get even so close to frozen roti canai is a small miracle in these parts. This week and the next will be very busy. (Right now I can't seem to do the drag-and-highlight thing with my mouse. Is it the PC or the mouse?) Anyway, my three sisters and daddy are coming over for a visit, so there won't be much opportunity for sitting in front of the PC. In case we are missed, I have here some bonus pictures. 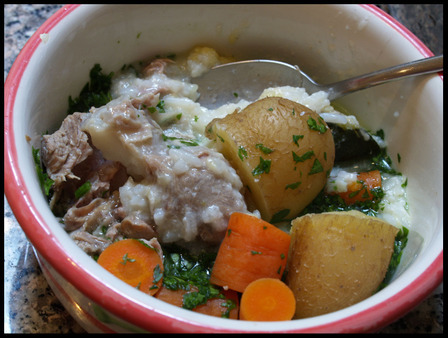 Above: Mimi's dinner- turkey, potatoes, carrots, cauliflower, zucchini, chopped parsley and an unattractive splodge of V's congee- left to cool before we sprinkle her seameal supplements on top. As usual, Rufus finishes first. Another fact, even though Rufus is 40% smaller than Mimi, his tongue is nearly 30% longer. 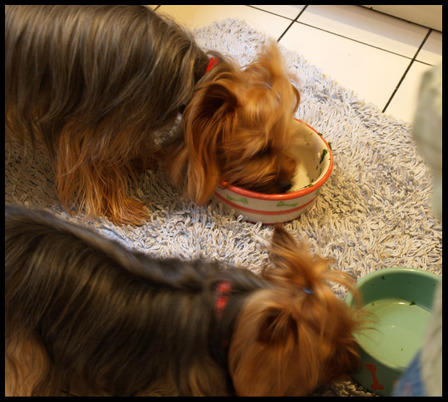 We know not from actual measurements, but by seeing how far down they can lick the yoghurt jar. Interesting, no? M friend Andrew (ttc) nominated this blog for the food blog section of Blogger's Choice Awards, unexpected but truly appreciated. Now, if there are any of my readers out there who like to visit my blog, maybe you can spend a bit of time and vote for me too. At least don't let me languish at the bottom of the heap lah! Many many thanks! Tomorrow morning we leave early for the train station, we have to be back in time for me to sit for my exams. I would really like to spend more time here, London makes me so very happy. Time has flown and we've been here nearly six months. The weather has been wet and humid sometimes it feels like we're back in Singapore. 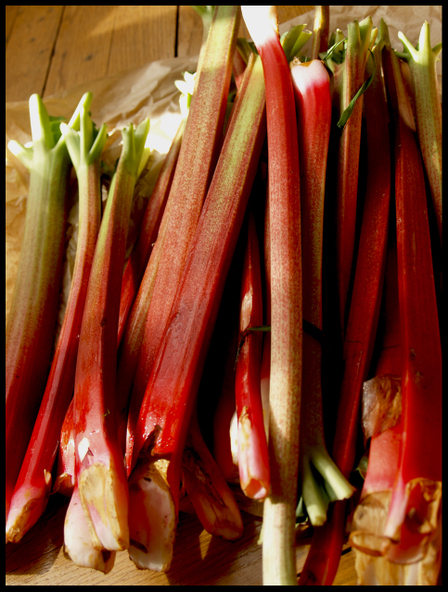 But it would not be easy to find rhubarbs back home. We've been eating loads of this tart and gorgeously scented " pink celery" as some of my friends call it. We'll be in London next week, where I'll be mugging for my French exams in between the mandatory foraging. 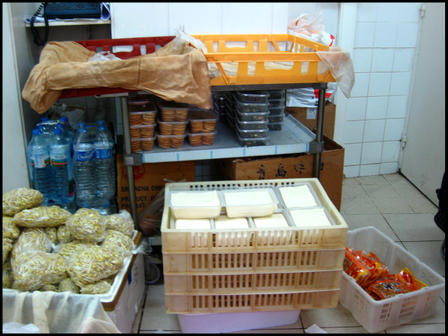 In the meantime here's some pictures of an actual tofu shop in Paris. Yes, where they make tofu fresh. Not even Singapore can beat this. The shopfront doesn't look promising, no? I've in fact passed by a few times and from a few yards away it always seems like it is closed. But we were in the neighbourhood one Sunday and I reasoned to myself that a tofu shop cannot be closed on the busiest day of the week, and so walked up the hill to have a better look. Sure enough, it was open, but not exactly screaming a big welcome. Sorry, I don't have the address, but it is along one of the sidestreets that branches off from the main drag of Rue Belleville in the 19th arrondissement. Update 19 May 2007: It is located on Rue Rampal. Thanks nardac! 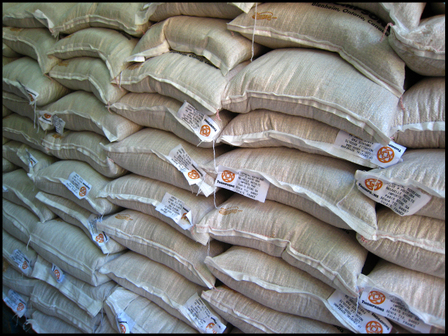 On the right side, as one enters, there are stacks of soy beans. On the left, more cartons stacked high enough to make the room appear dim. There was a short queue in front of a counter wherein were displayed the various forms of soy products- soft tofu for steamboats, fresh beansprouts, pressed and seasoned tofu skins, etc etc. But almost everyone was there to buy one thing, i.e. fresh tofu, still warm from the production room next door. The tofu was amazing- mildly sweet and fresh tasting. 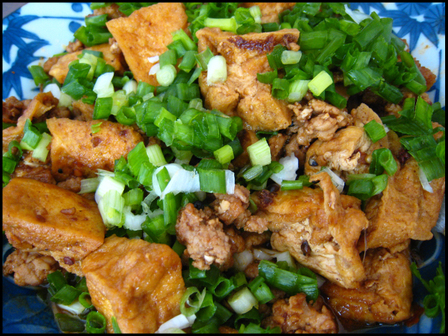 We made mapo-toufu, steamed tofu, put them in soups, no matter how we cooked it, every bite was delicious. 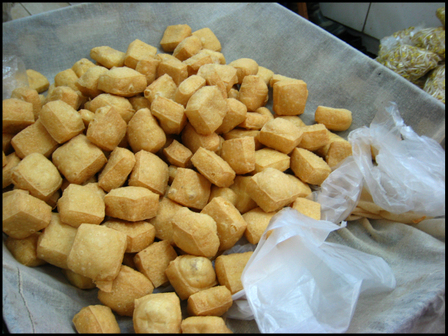 Nothing beats fresh tofu to make us feel completely satisfied and at peace with the world. And by the world, I mean that it includes Paris which I am forever whinging about. Bon Weekend! 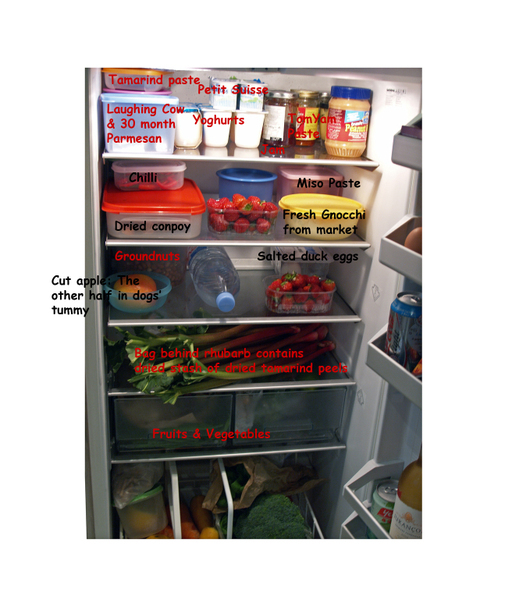 Sam suggested we do a show and tell of our unedited fridge. Here's mine, taken two Saturdays ago. It looks quite bare doesn't it? 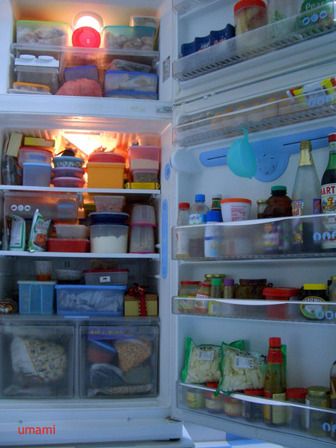 Most of our other foods don't get to live in the fridge- root vegetables, apples, oranges, grapefruits, husband's teas, marmite, ketchups, wines, spirits, syrups, honey etc. But it houses our precious hoard of dried conpoy, dried tamarind peels, Baba curry paste and keeps the chillis and lemongrasses fresh. We were surprised to find things like salted duck eggs in the shops here, and also not too embarassed to own that we use jarred tomyam paste. In terms of produce, some are organic, some are 'bio', some are neither. I also do not particularly go out of my way to avoid cheaper produce from Morocco or other Northern African countries which apparently abuse their farm workers or are deemed less righteous or politically correct. We get through kilos of stuff a week- as happens when there are 3 adults, a kid and two dogs who eat homecooked meals almost daily- so if I can save some euros I do not mind. The door of the fridge is for keeping face masks, bits of kiddie chocolates and the indispensable passata. The doctors advise us to feed the little one with Vit D supplements, doesn't sound too appetising to me so we give her cheeses like the Laughing Cow and Petite Suisses. 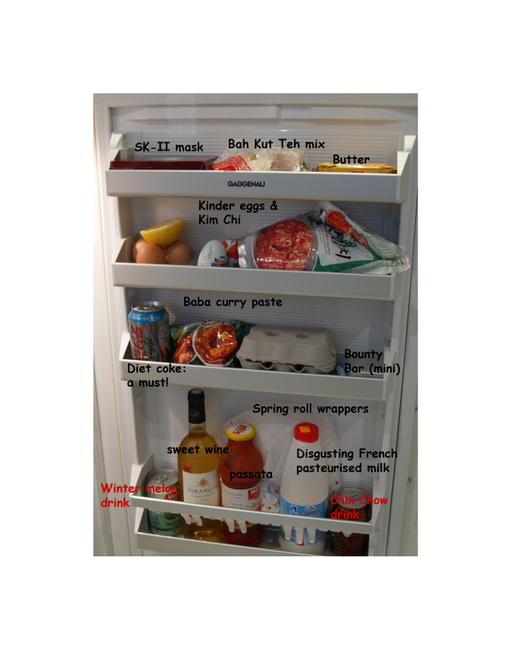 I also managed to dig up pictures and posts of my TWO fridges in Singapore, circa Dec 2005. 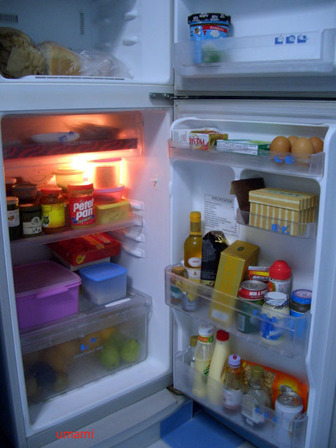 Back then, we put almost everything in the fridge because the humidity and heat makes food spoil faster, and of course there were two more adults to feed as well. The Tupperwares got used a lot more in those days. 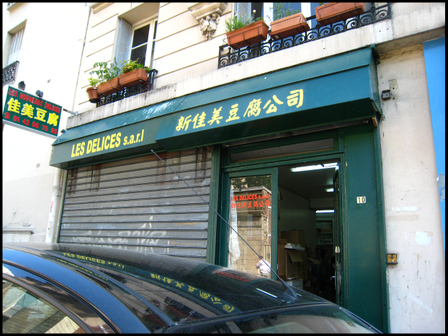 Husband and I were at Tang Freres supermarket in the 13th arrondissement. 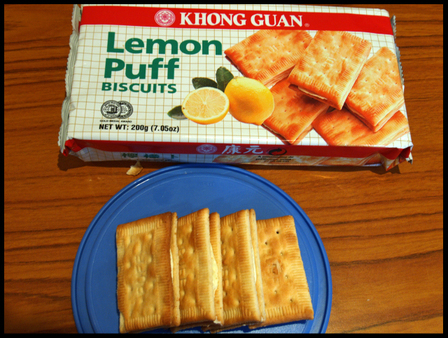 He put into my basket two packs of Khong Guan Lemon Puff Biscuit. Not enough, I said, so he trotted off to get two more. Goes to show that old habits die hard. We may enjoy the novelty of pure butter French biscuits in the beginning, but these days the snack stash is made up mostly of Japanese rice crackers, Ika Peanuts, Korean shrimp crackers and even Pringles. BTW, the Pringles here are tasty, unlike the icky made-in-Thailand/China versions back home. Once the Chinese void in the tummy was filled, it was time for the English goodies. I have a great fondness for British foods- cheddar, Branston pickles, Ploughman sandwiches, baltis, onion bhajis, Marmite obviously, also malt bread, a good roast, Yorkshire Pudding, prawn cocktail sandwiches, pickled eggs, lemon curds, Maid of Honour tarts, Colman mustard, Heinz ketchup and baked beans, sticky puddings of either toffee, dates, treacle or golden syrup, institution fruit crumbles and requisite mystery custard, cucumber sandwiches, salt and vinegar crisps, Twix bars, Jaffa cakes etc etc. Foods that my husband would probably not really understand, him who spent nearly equal number of years as me but in this side of the channel where he was enticed by oh, I don't know, Diabolo Menthe, couscous and erm, more couscous. That is not to say that I ate all of the things in the list above. I wish I did, but some are already extinct- like the sticky malt bread from a bakery in High Barnet, where can I get it now? also the Maid of Honour tarts which was my only reason to suffer the long tube journeys to Kew Gardens oh so long ago- and well, some we can buy over here or do without for a little longer. Sometimes old favourites pop up unexpectedly, ok not so expectedly but certainly in an unplanned way. It sounds confusing but here it is, I went to Borough Market on a Friday afternoon, and found lots of nice things of course, like hippie chocolate brownies, truffled salamis, loads and loads of gorgeous jams and even Cheddar made from unpasteurised milk. All of which went into my BHV shopping bag and eventually back to Paris. But some foods I just had to eat almost immediately. Like pork pies. 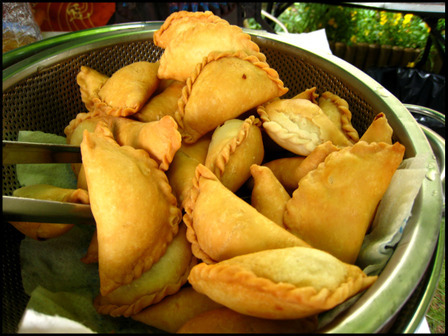 Now friends and family know that I am not a big fan of pie, we come from a family who dive into the fillings of curry puffs and eschew the skins which makes more sense then to just eat curry itself. 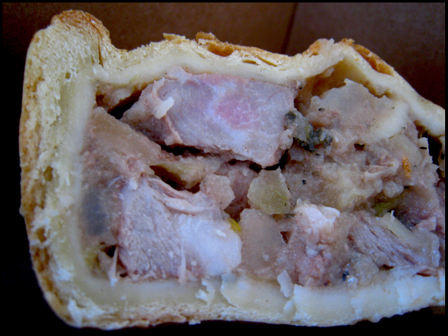 But pork pie hold a different kind of charm for me- the thick lardy pastry chews densely, the meat inside is cold, both of which sounds not terribly appetising- but somehow I like it. It is something I used to munch and nibble on slowly for long winter suppers in front of the telly, by myself, one of my guilty secrets, along with imbibing shots of neat vermouth from the bottle stashed in the cupboard above the oven. I'll say that the only thing better than a good pork pie is a pie filled with pork and game meats, but it is not game season yet. Well, back to Borough Market. 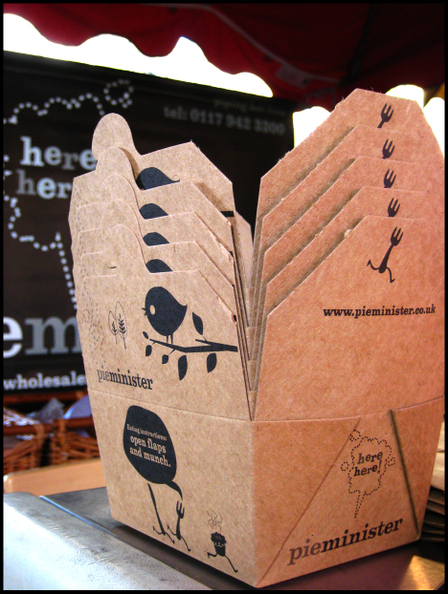 The first pie stall that I came across was Pieminister. 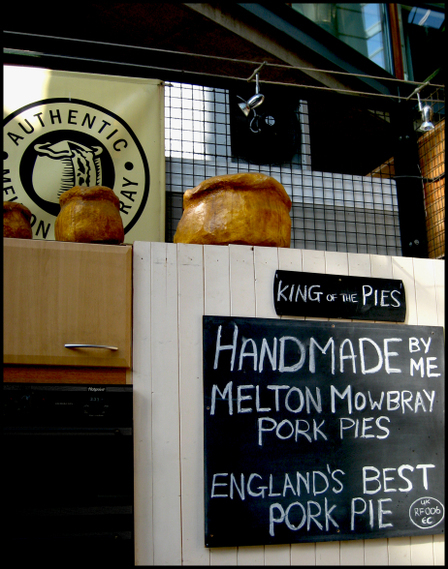 They have many different pie varieties, the pork pie sounded especially interesting. Pork layered with apples, maybe some cider, ham and well I can't remember now but at the time it sounded like all things porky and nice went into the pie. The packaging was quirky too, naturally I had to buy one. But it was a big disappointment. It was a pie that sounded and looked better than it tasted, the meats were not especially interesting tasting and the fruits, spices and herbs were especially muted. If we were blindfolded we would not know that we were eating anything special. Back in my sister's flat, we cut it up and tried it, but nobody wanted more than a bite. Further inside the market there were more purveyors of pork pies. The Mrs King stand even proclaimed that they make the best. 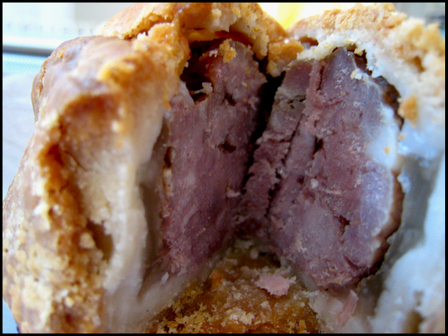 And they certainly look quite like the old fashioned ones that hails from pork pie country in Melton Mowbray. Fortunately for us Mrs King told the truth. In a side by side test with PieMinister, it far overshadowed the latter with its skin that crumbles yet retains a satifying dense bite, and pure pork fillings that is seasoned just so. You see, my sister and husband hadn't tasted many, if any, pork pie in their lives- indeed, they were very surprised that I would eat such a thing that seems so "too much" what with the packed pink meats (nitrites! my husband says in big thought balloons above my head) and stark intimidating pastry. Both of them said it was rather good, and I quite agreed. I added the Colman's and it became very very good. I allowed myself another wedge and stopped, a meal at St John's was waiting so I had to pace myself. I kept the rest for the next evening, so that I could savour it slowly on the way home in the Eurostar. Mrs King's also sold sausage roll, another old favourite. It used to be that sausage rolls had real pork meat wrapped in flaky pastries but nowadays we have to settle for plasticky hot dogs and rubbery pastries. Mrs King's version was sadly not terribly tasty- the meat was way too fatty and one got sick of eating it quickly, the pastry whilst flakey was also way too oily. Or maybe it didn't taste that great because I did not smother it in brown sauce as advised by a fellow customer. The next day I was accompanying my sister on her marketing rounds in her neighbourhood along Angel. We passed by a bustling bakery-cafe but did not go in at first because we had a dim sum lunch to eat later. 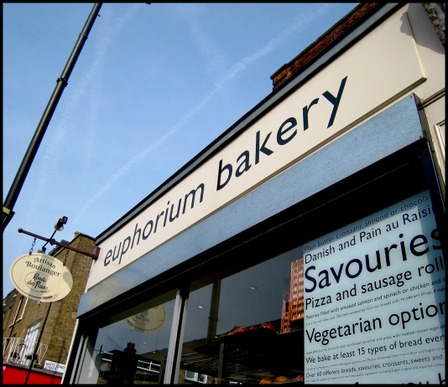 Then she popped into the neighbouring frame shop and I could wander back, and promptly bought myself a sausage roll (see above image). What a beauty eh? 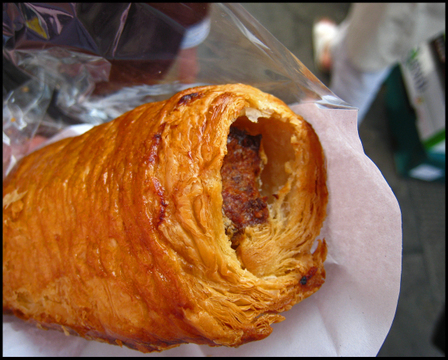 It lived up to its appearance too, freshly baked with lovely crispy pastry layers outside and perfectly seasoned sausage meat inside. This is the name of the bakery. The frame-shop owner next door also agreed that their sausage rolls is one of the better ones around. See, even the locals approve. 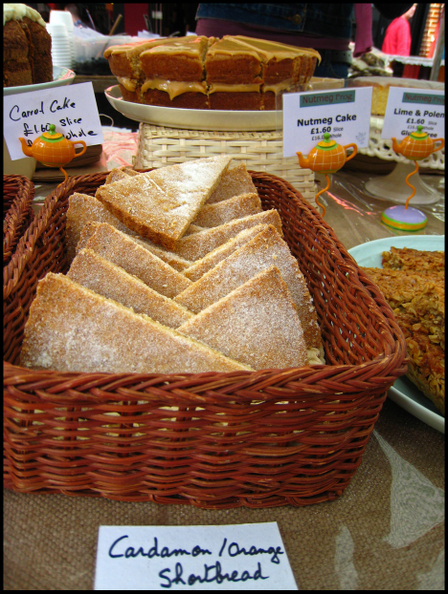 Then it was off to Exmouth Market, if a collection of about 8 stalls selling prepared foods can be called a market. But Exmouth is lovely to shop at, the retail stores around it is chi-chi and posh, and the market stalls are themselves selling very high-quality products. We scored some inexpensive espresso cups, some panettone for my sister, Eccles cakes from St John's Bakery (they're the best!) and another favourite- shortbreads-, this time with cardamon and orange flavours. Which leads me on to another list, that of lovely Scottish foods- porridge, whisky, kippers etc etc........Oatcakes anyone? Last Saturday I participated in the "24 hours of Flickr" event and took a series of photographs recording the events of the day. Click this link to access the set of pictures and notes. Can you believe we ate at Royal China THREE times within a week! 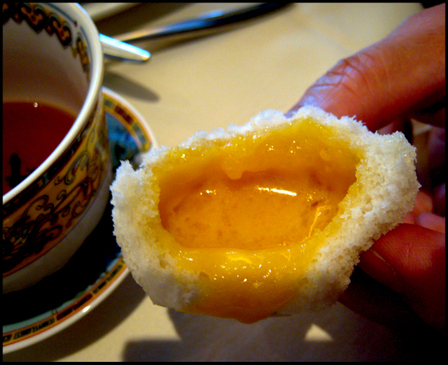 Top on our London eating list was dim-sum. In Paris, where roasted meats, claypot dishes and stirfried noodles is the best we can ever hope for in the way of Cantonese food, we held off from eating dim sum knowing that here, there is simply no way these delicate morsels can ever be done right. Well, The wait was worth it, and the first meal of the trip was dim-sum. 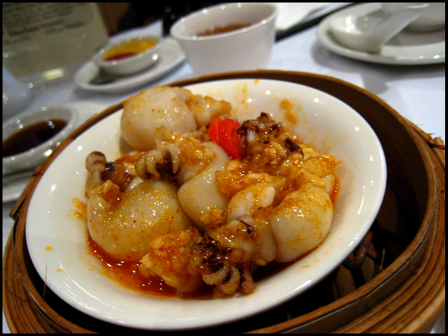 For husband that is, he had a business lunch at a Royal China at 40, Baker Street. Me, I had to contend with what passes of for laksa at the nearby Bugis Cafe in Gloucester Rd. He came back from his lunch with a satisfied euphoric expression, the food was damn good he said. I made him take me there the next day, and finally I could eat me some excellent dim sum. I have to say, it was total bliss. The lobster dumplings came in a cute little basket, and the fillings included generous chunks of lobster cooked with chinese wine and fresh vegetables. To-die-for. It also cost 6 pounds per serving! All the dim sum items we tried were impeccable:braised chicken feet just about perfect in seasoning and skin resilience, silky-smooth cheong fun, cha xiu baos acing all the components just-so. These people are seriously at the top of their game. The custard buns remained warm for quite a long time, and still managed to be soft and oozy when we finally got round to them. OMG so very good good. Even the teas were the premium stuff. It was only midway during the meal that we realised that we were at the Royal China Club, the most upscale of all their outlets, hence the elegant decor and deferential service. We returned again over the weekend, for one final fling before our train journey home. This time it was to their more modest outlet a few yards away at 28 Baker Street. Notice the teacups are of the more durable, everyday type, and the baskets a lot more seasoned. 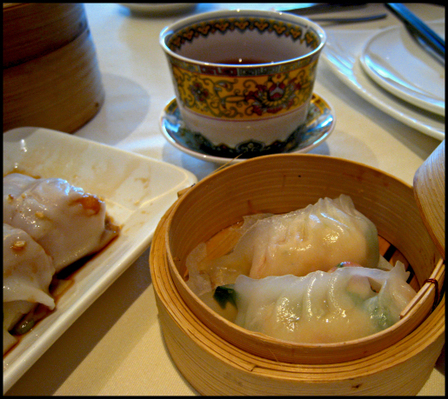 But the dim sum remained just as exemplary, and the prices much more affordable. They have outlets all over London (and we know about the Singapore one, no?) We have been enthusiastic fans ever since they first opened in Queensway/Bayswater more than a decade ago, but the Baker St location is not too bad. A short walk away is Oxford Circus, where the Selfridges food hall tempts with the likes of honeyed Gorgonzola and semolina cake with almonds and lemons. It's a good thing that tomorrow is a public holiday. No classes, no having to drop off & pick up V from halte garderie, no errands. I need the time to catch up with quilting mummy's green quilt, study for my exams and process the backlog of photos. So posts will be slow in coming through. Anyways.... One of my favourite places in London for super-duper no-nonsense bonafide Cantonese dishes is the New Mayflower Restaurant. The place has changed little since my student days of nearly 20 years ago- the service is brisk, the tables cramped close together to accommodate the perpetual crowd and the promise of a complimentary bowl of tong-sui at the end of the meal (for Chinese customers only, they think the ang-mos don't know how to appreciate sweet soups)- I never miss eating here however short my visit to this city is. I remember their khao yuk -belly pork layered with either taro or preserved mustard then slow-braised with bean paste sauce- is especially yum, even better than my mom's. This time though, we opted for the more healthy tofu braised with nam-yu and it was equally good, not too salty or assertive so as to let the tofu taste dominate, simply excellent. 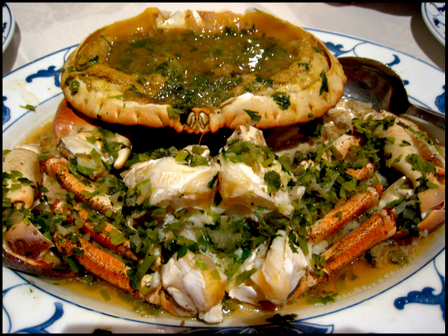 And of course, there's their signature Crab Steamed with Chicken Fat and Huatiao Wine. The wonderfully sweet and succulent crab meat, the thin layer of custardy egg white floating in a slurpily delicious soup that calls to be drenched onto a bowl of rice. We did just that, and I was happy.